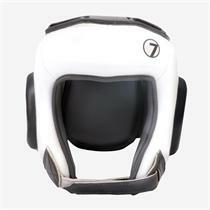 Stay fully protected with Seven's MMA style headgear. Firm but comfortable padding guards your head from strikes while sparring or grappling. Up top, the padding is in a cross shape that offers thorough protection while letting excess heat escape, great for cooling and ventilation. Around back, the padded hook-and-loop panels open laterally, allowing you to easily get the proper fit. Along the sides, there are generous ear holes, padded but still providing clear hearing and comfort. Measure the circumference of the head at about an inch above the eyebrows to determine your proper headgear size. It's easy! Wrap a string around your head and measure the string. Email your friend about the Seven Fightgear MMA Lightweight Headgear. Ask a question about the Seven Fightgear MMA Lightweight Headgear.